Tracked rail transposer in action with McCulloch Rail personnel Bob Agnew, Billy Jordan, John McConnell and Dale Mitchell with Andy Arnot Michael McMaster and Jack Bishop (Ayrshire Railway Preservation Group). Ayrshire Railway Preservation Group has been able to recover lines and three track points from the old Minnivey Colliery site before the area is cleared and landscaped, thanks to the free help of a local rail company and a transport company. 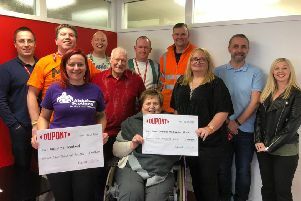 McCulloch Rail of Ballantrae, a major contractor for Network Rail, provided the manpower and specialist machines needed to move the rails, which ARPG volunteers had freed from the overgrown vegetation covering them at the old colliery site.